A 2015 Amnesty report declared the stateless Rohingya of Burma to be the most persecuted refugees in the world. Their Burmese majority tormenters are trapped between a forgiveness shortfall and a surfeit of rancour at the abortive Rohingya attempt to be annexed by East Pakistan in 1948 followed by an armed insurgency seeking autonomy or independence. Reprisals have devastated the civilian population. There are currently 140,000 Rohingya refugees mired in squalor in Bangladesh, India and Thailand in the latest phase of their on-going exodus. Archbishop Desmond Tutu has called the violence against the Rohingya a “slow genocide”. Nearly a million and a half and Muslim by faith, they are mainly concentrated on Burma’s western coastal state of Arakan/Rakhine where they make up around 90% of the population. They are generally considered to have migrated from present-day Bangladesh during the British Raj, although an indigenous origin has not been ruled out. One year later, Saudi Arabia announced the grant of permanent resident status to four million Burmese workers, presumably Rohingya. This laudable example of affirmative action still leaves the current crisis intact. To benefit from Saudi Arabia’s largesse, a Rohingya has to enter Saudi Arabia legally. Even if the Saudis were to follow Angela Merkel’s example, the Rohingya victims can’t afford the passage. So the next logical step is for Saudi ships to anchor off on Burma’s territorial waters and take Rohingya boatloads on board. Financially, they can afford it. The political risk is negligible, since Burmese muscle only flexes within its borders. Last year, Qatar also pledged $50 million to Indonesia to host Rohingya refugees, generously stretching its arm to keep them at bay. Indeed, because these refugees are jobless, poor, unskilled, carry diseases and, actually smell. No one would want to have them in the neighbourhood. Qatar should take its inspiration from Germany and Italy — maybe hire a slick refugee consultant with blow-dried hair and a killer smile? Oil rich Arab countries wholeheartedly support Palestinians who, of course, also provide a ready means of restoring Muslim sovereignty over the Holy Land. 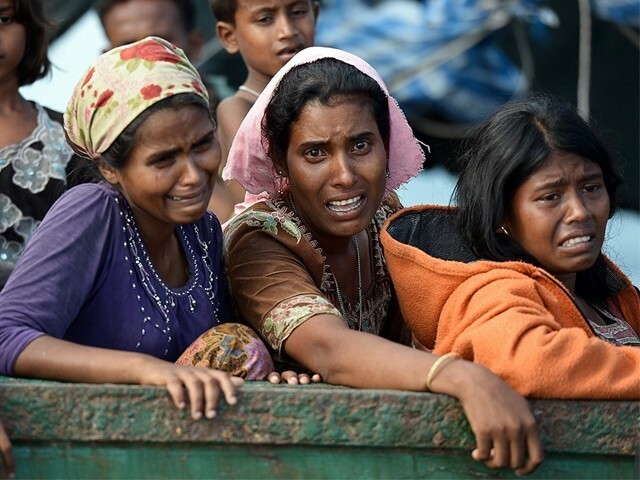 Alas, the Rohingya only have their gratitude, dark skins, rickety bodies and battered souls to offer. But Saudi Arabia and Qatar can only be reproached for failing to meet high expectations. The persecution itself calls out the Burmese Buddhist majority led by a Nobel Peace Laureate who, as the state counsellor of Myanmar, is the de facto head of state. On the subject of Rohingya persecution, the Oxford-educated Aung San Suu Kyi thrives as the serenely mute counsellor. And the world lies back and lets its intelligence receive these resounding insults without reminding her that her own most outstanding qualification is being a victim of persecution. She has a dozen international awards ranging from the United States’ Presidential Medal of Freedom to The Jawaharlal Nehru Award for International Understanding and the Sakharov Prize. Did I hear you applause, Rohingya? Their repression seriously tarnishes the renowned Buddhist lustre. In 2013, his holiness, the Dalai Lama, pleaded with Burmese Buddhists to end the violence against the Rohingya. Last year, he urged Aung Sang Suu Kyi to speak out on their behalf. Six months ago, he repeated the demand, answered by her deafening silence. Burma’s moral wasteland is overcast with “shades of mediocrity, like emptiness in harmony”. Three forces can converge to inject solvency into Burma’s moral bankruptcy. The Dalai Lama, the Pope and the Mufti of Al Azhar University need to announce a joint visit to Burma, to exert pressure on its Buddhists, get the world’s attention and reassure the Rohingya, respectively. Burma would be hard put to refuse such a visit. Were the three religious leaders to publicly demand an end to the violent reprisals and the placing of United Nations observers protected by a UN contingent, it should be enough to move the problem from the paddy fields and narrow alleys to a well-appointed conference room.